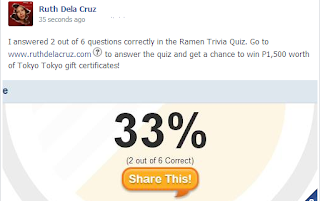 ruthdelacruz | Travel and Lifestyle Blog : Take the Ramen Trivia Quiz & Win Tokyo Tokyo GCs! 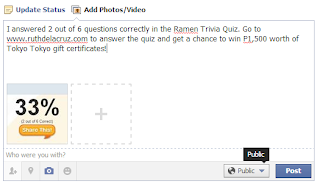 Take the Ramen Trivia Quiz & Win Tokyo Tokyo GCs! Tokyo Tokyo gave me a lot of good memories and big bowls and bento boxes of good food! We always go to Tokyo Tokyo for good affordable meals back in College and when we feel like loading on carbo (who doesn't love their "rice-all-you-can" treat)? It is nice that Tokyo Tokyo has expanded and opened stores around the Metro. No need to go to Japan to enjoy our sushi, gyoza, and sumo meals! Speaking of Tokyo Tokyo Sumo Meals, one of the brand's most popular items, Tokyo Tokyo now offers a bigger serving for sumo meals. 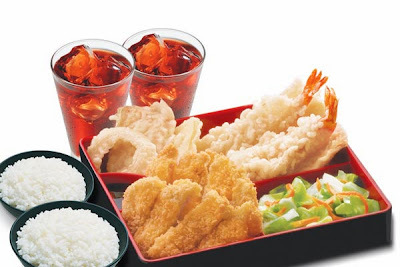 You can now combine any two Tokyo Tokyo signature meals such as Beef Misono, Pork Tonkatsu, Fried Chicken Karaage, Prawn & Vegetable Tempura, and Honey Chicken Teriyaki. The entire bento box comes with two steaming bowls of Tokyo Tokyo’s unlimited rice and two glasses of refreshing Red Iced Tea. And what is good meal without a bowl of hot, piping and flavorful ramen? 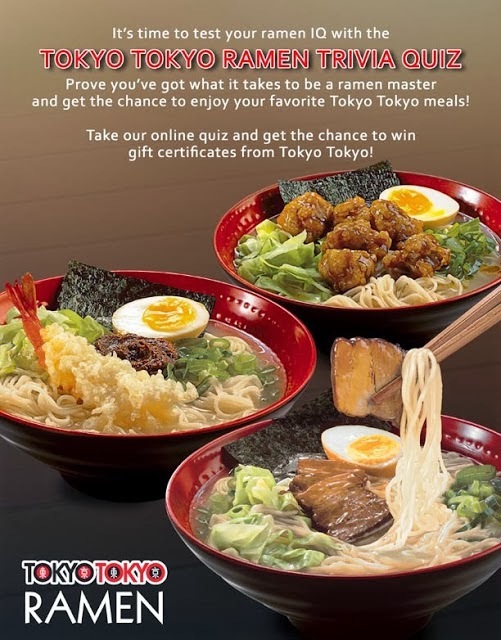 Tokyo Tokyo recently introduced Ramen line featuring three flavors: Braised Pork, Spicy Chicken and Tempura Miso. Packed with authentic Japanese flavors, a piping hot bowl of Tokyo Tokyo Ramen is just the thing for this cold 'ber' weather. Here's a treat! I will give you a chance to treat your family and try this new delicious offerings from Tokyo Tokyo! 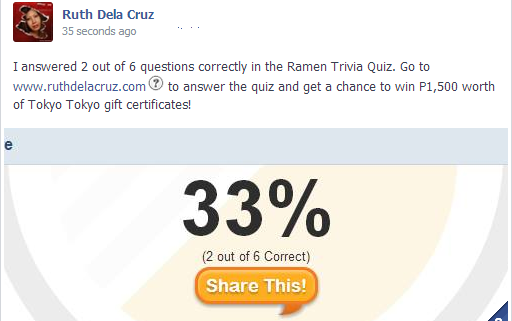 You don't need to review and study, we just want you to take this quick Ramen Quiz! Easy ways to join and win! Winner will be announced on this blog. Giveaway will run for 3 weeks! Congratulations to Zarah Villacorta for winning Php1,500 GC from Tokyo, Tokyo! with subject line Tokyo Tokyo Winner. Make sure to set your status to PUBLIC. I know, I haven't studied my Ramen, but that is okay. It means, you can still win even if you didn't get 100%! Thank you so much Tokyo Tokyo Philippines for sponsoring this giveaway! © ruthdelacruz | Travel and Lifestyle Blog : Take the Ramen Trivia Quiz & Win Tokyo Tokyo GCs!